Last weekend, I packed my bags and drove down to Des Moines for my first experience participating in the Iowa Artists State Show. 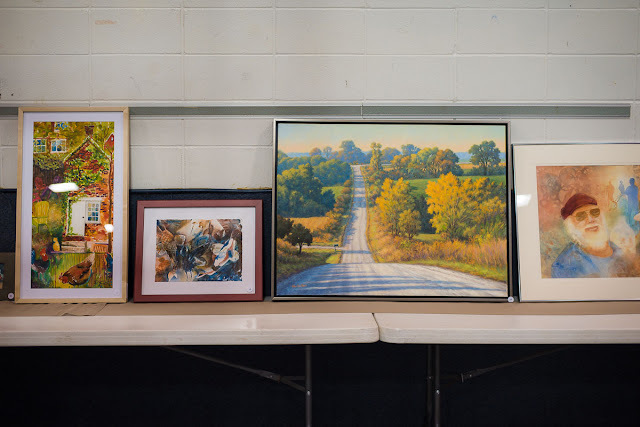 For the unfamiliar, the Iowa Artists group is open to all Iowa artists who want to join and share their art and experiences in the Iowa art world. 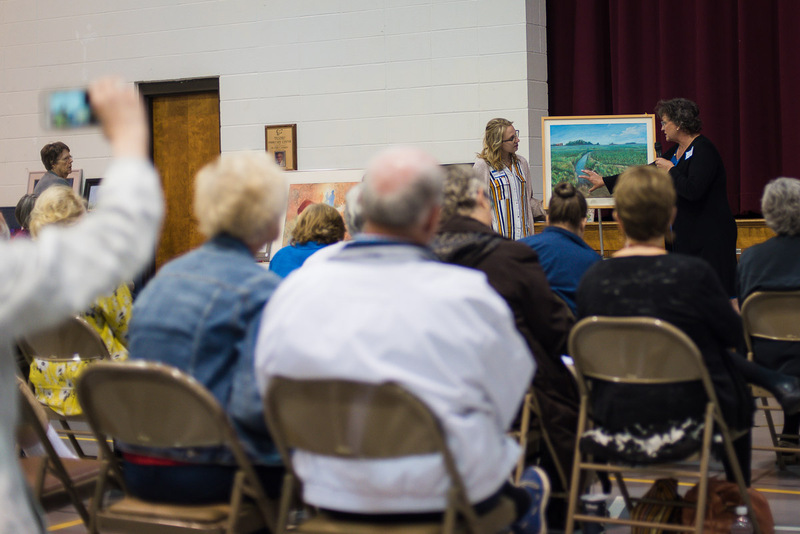 The group's mission is "to promote and educate artists throughout the state." 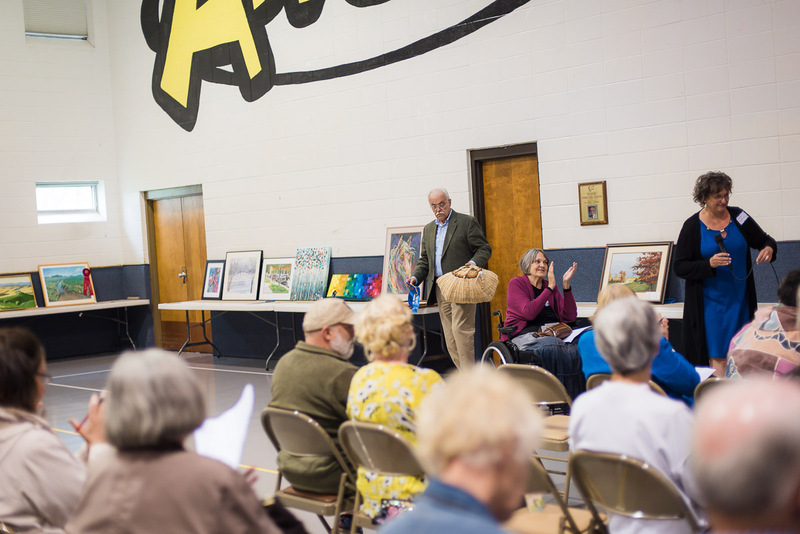 The group has been going strong since it was established in 1970 and is comprised of artists from across the state and from all different art backgrounds. 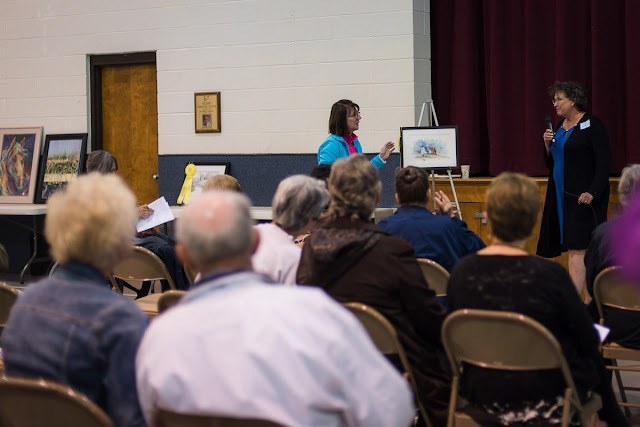 Watercolors, oils, acrylics, pencil, and more lined the room. 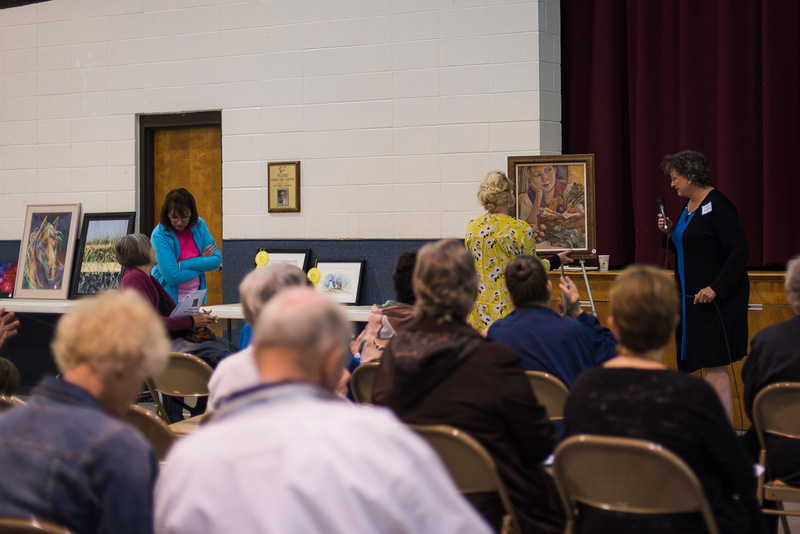 When I moved to Iowa nearly five years ago, I wanted to get involved and meet other artists in my area. I was so lucky to find such an awesome group of artists who welcomed me with open arms! Joining the Clayton County Artists is how I found out about the Iowa Artists, the state wide art shows, and so much more! On the right is Judith Crandall's vibrant painting "Do I Stay or Leave," which was done with Cattle Markers. 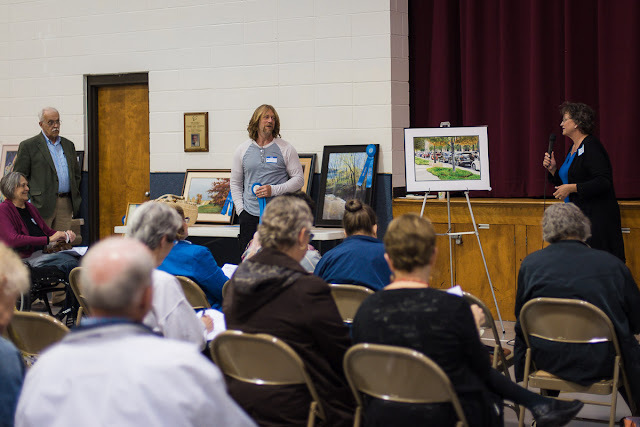 If you're an artist in Iowa, you should definitely check it out and join us! You can find out if there is an artist group near you and more about Iowa Artists over on The Iowa Artists website. 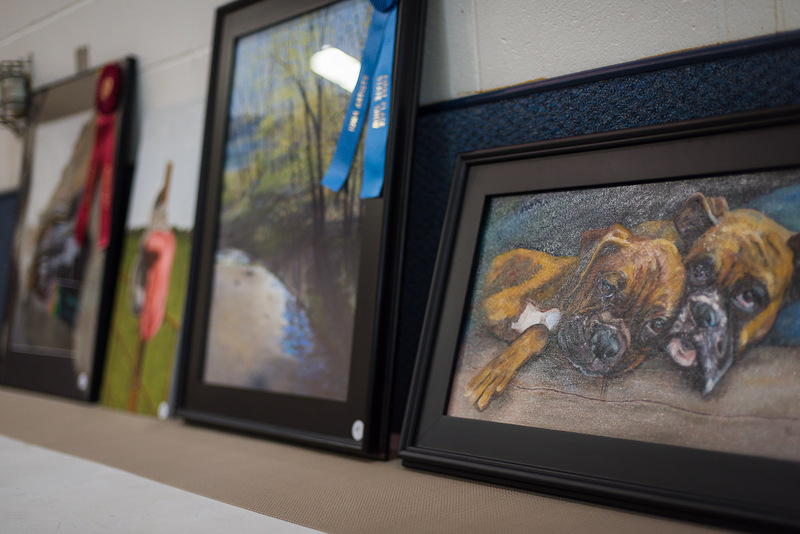 Clayton County Artist and owner/artist of Bent Willow Studio in Guttenberg, Rabecca Hennessy, showed her oil painting of two cozy boxers "Making Room." I particularly enjoyed this whimsical watercolor titled "Chickens in the Yard" by artist Deborah Madsen Burrow! Her use of color, the size and shape of the piece, and the whimsical surreal layout pulled me right in and held my attention. Beautiful job, Deborah! Art from all over Iowa lined the walls for an enchanted show! 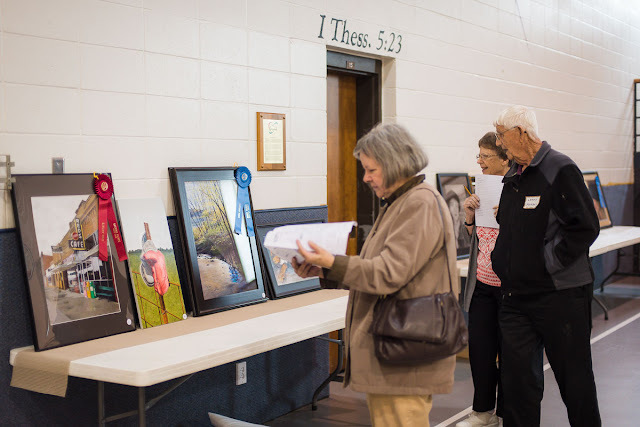 In order to participate in the Regional Show, you must first sign up to be a member of the Iowa Artists (an annual membership is just $25 and then you do not need to pay any entry fees to participate in the art shows). 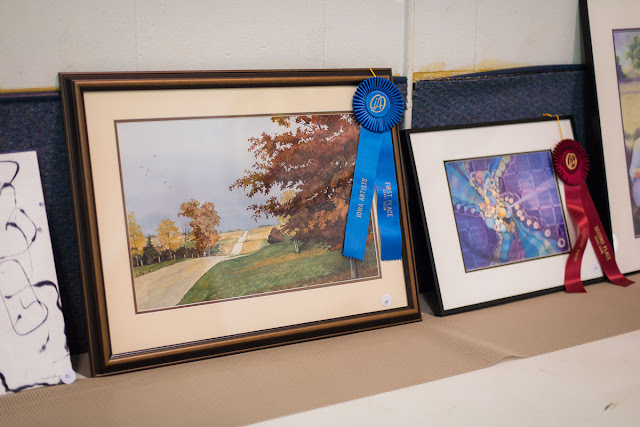 Artists at Regional Shows are awarded 1st, 2nd, 3rd, and honorable mention ribbons depending on the number of entries. Then all of the artists who win blue ribbons at Regionals advance to the State Show. 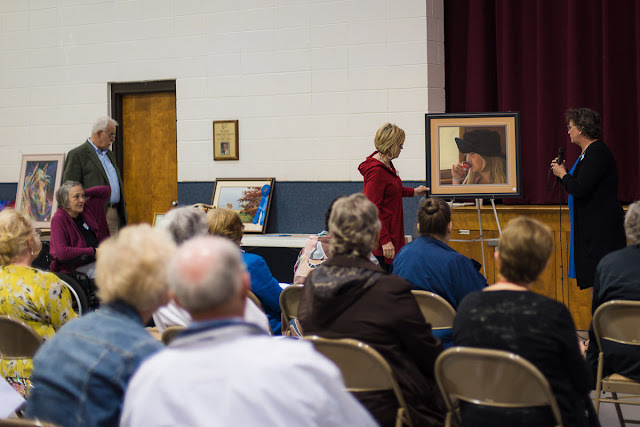 At both Regionals and States, there is a brief business meeting, refreshments, a presentation by the judge, and the artwork is judged while all of the artists go out on their own for lunch. The show then opens to the public in the afternoon. The artists return from lunch to find out if their artwork has won a ribbon... and man, is that an adrenaline rush! The show is then typically open to the public from 1 to 3 PM and the artwork that has won ribbons is brought to the front for a critique from the judge. I was super thrilled to earn my first blue ribbon at Regionals with "Outdoor Adventure" and advance to participate in the State Show. 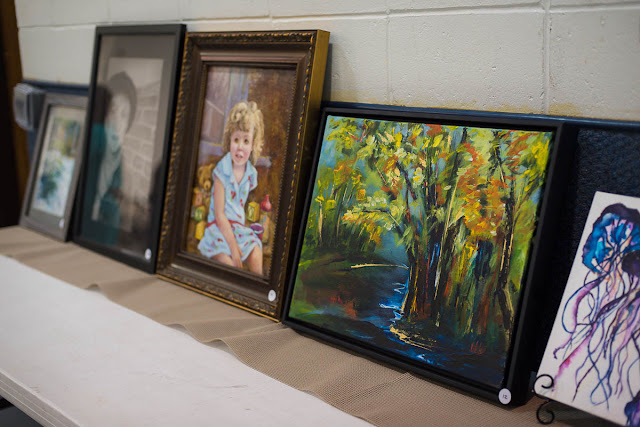 You can see images from our Region 3 Show here! 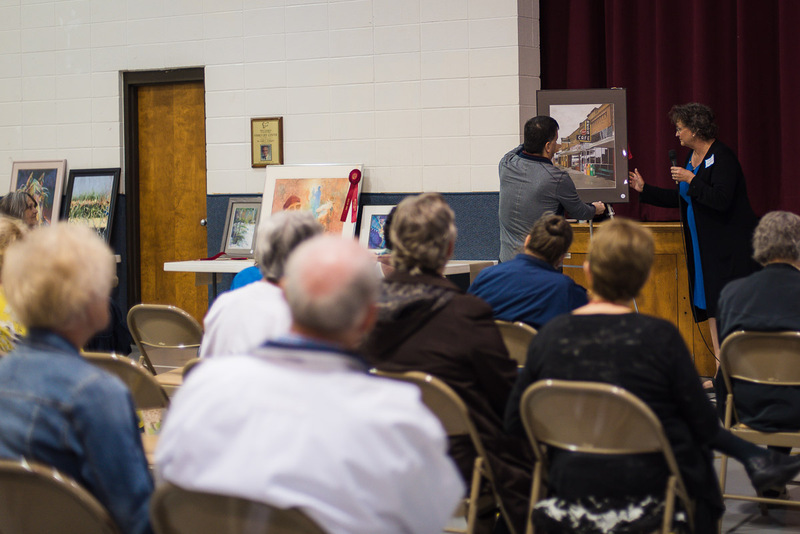 Nash Cox talks with another artist about his watercolor painting, "St. Scene I." When I arrived at the State Show, I was instantly humbled by the talent surrounding me and I was immediately drawn to several pieces. I even recognized a few artists right away. Of course I knew my fellow Clayton County Artists and I also recognized a few artists who I had shown with at Art in the Park Elkader in recent years, including watercolor artist Nash Cox. 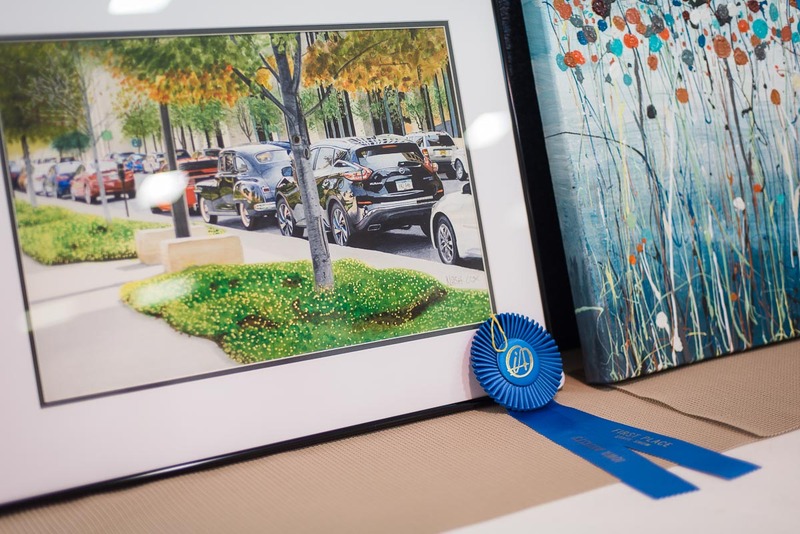 Nash was the Art in the Park 2017 Committee Choice Award Recipient and I'll be excited to show alongside him again at Art in the Park 2018! Obviously it was no surprise to me that he would take a blue ribbon at the state show... way to go, Nash! 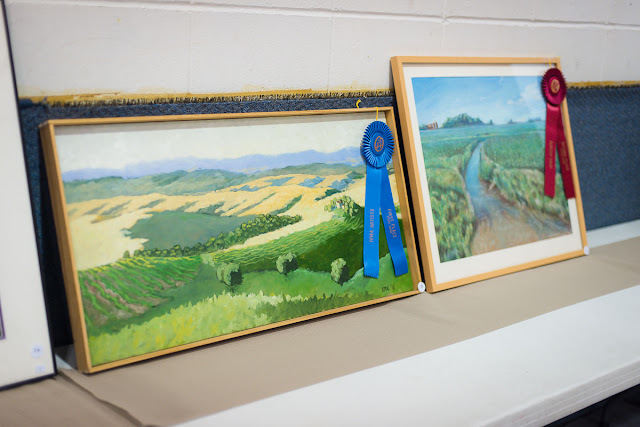 The shows have different judges each year, and at this year's State Show we were excited to hear from an artist and instructor with the Des Moines Art Center, Caryn J. Kepford. 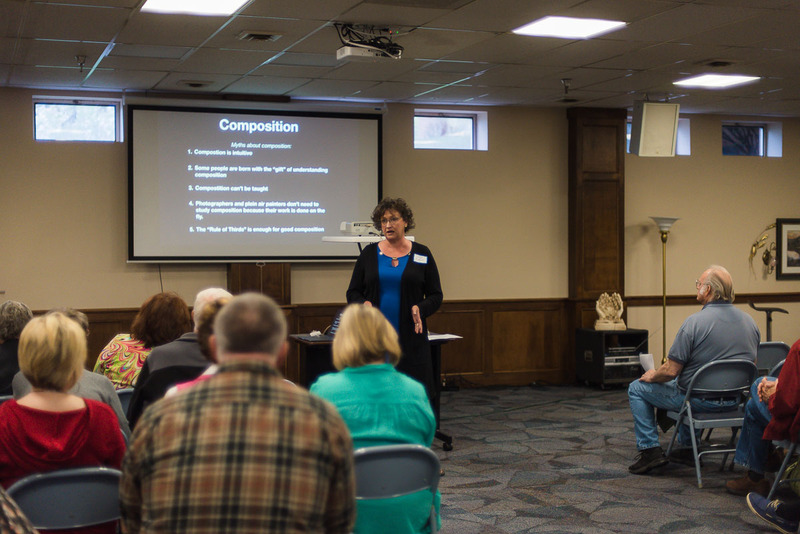 She presented on composition. Her main focus was on the use of the Golden Rectangle and Dynamic Rectangles in creating an interesting composition that feels good to the eye.These special rectangles have been used throughout art history and architecture. It was a really interesting presentation and I look forward to experimenting with these rectangles and paying attention to the points of interest in my future work. 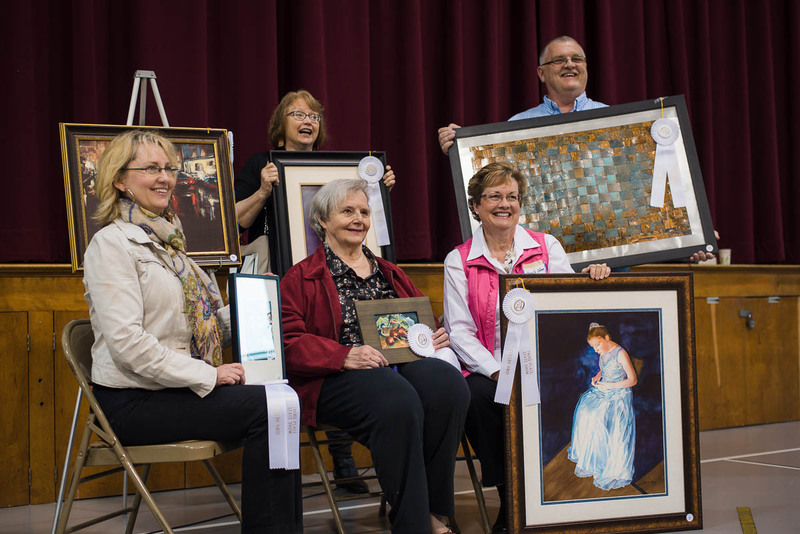 When we came back from lunch, everyone was excited to walk around the room and see which pieces won ribbons. 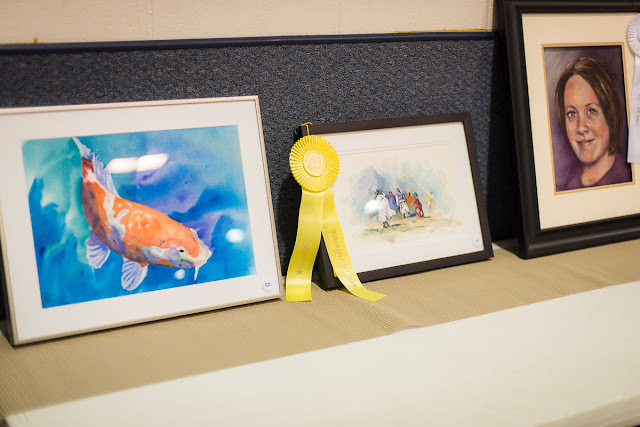 I think it's important to say that every judge in any art competition has their own idea and criteria that they choose to judge a show, and even then, I'm certain it wasn't easy as there was so much fantastic artwork! 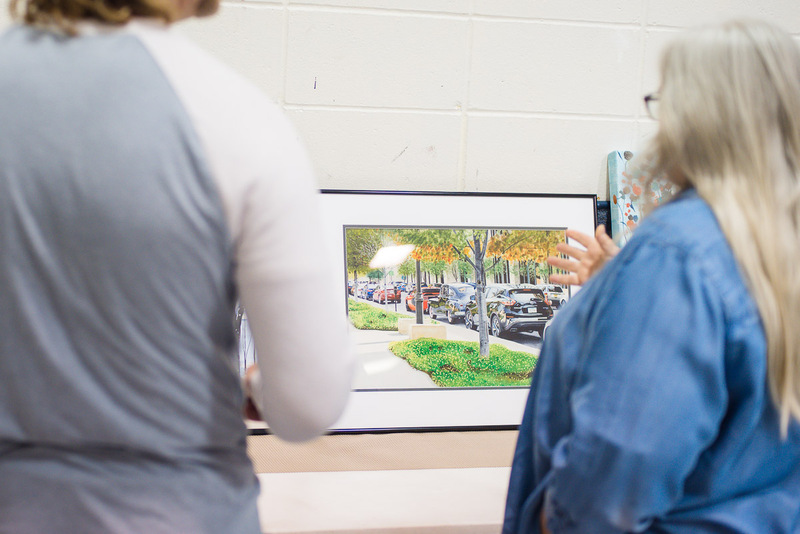 Caryn was also very engaging as she critiqued different aspects of the artwork she chose to award. 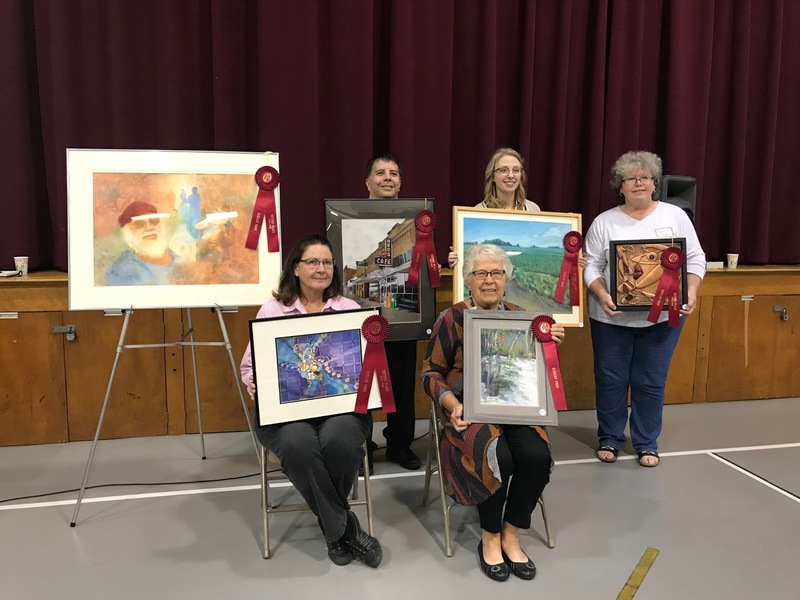 You can find Susan, Nash, Judith, Rabecca, and me (Jillian) at Art in the Park Elkader 2018! Of course I had to sneak a few group shots of the winners! Congratulations to Hans Olson! Hans won Best in Show and The People's Choice Award for his oil painting titled "Early Morning Light." The colors radiated and made this painting come alive. Again, congrats to all of you who advanced to the State Show and an extra congrats to those of you who won ribbons! 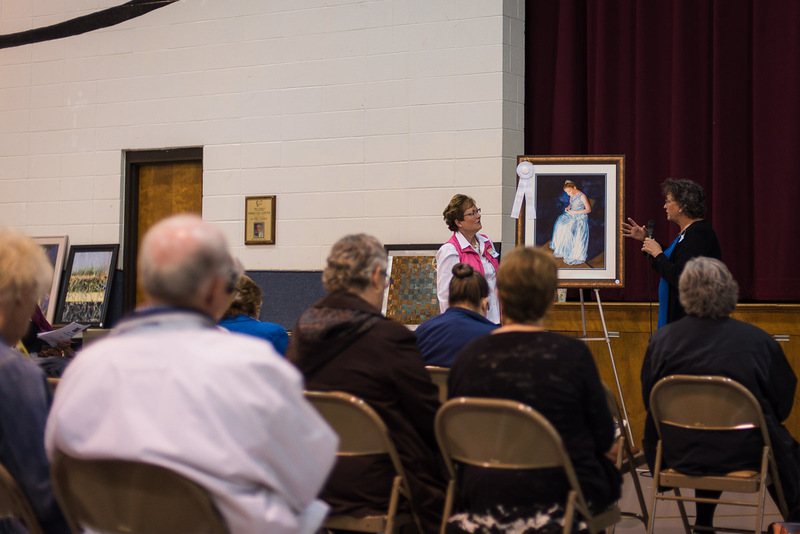 It was truly a fun and inspiring day in Des Moines. Whew! We made it through a fun long day of ART, critiques, and excitement! Region 2 took home quite a few awards! Way to go! Judith Crandall, a Clayton County Artist, receives a critique from the judge. 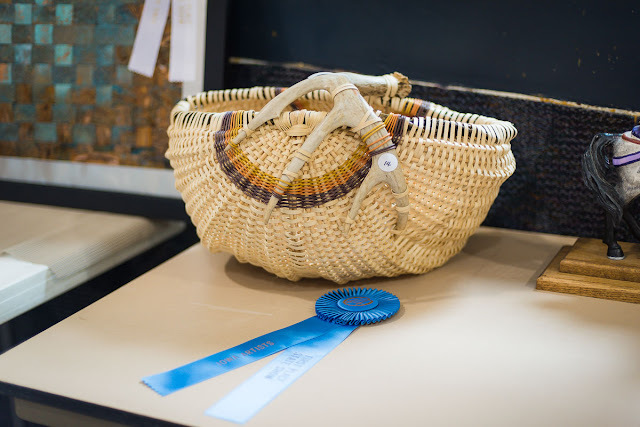 Susan's basket won a blue ribbon. The judge thought the shape was very interesting and not typical. She liked the use of the antler and how it mimicked the weave. 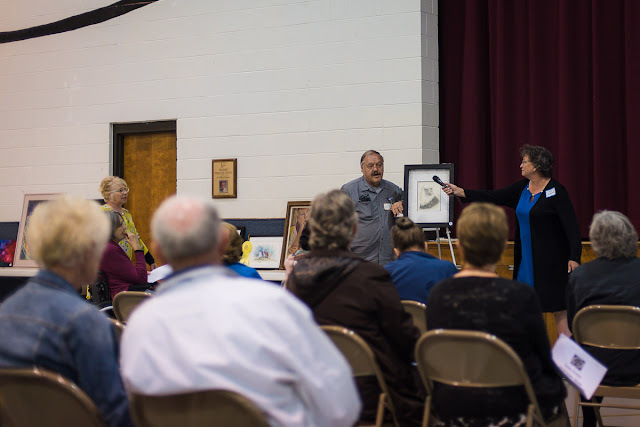 Caryn discussed the phenomenal quality and perspective of Dave Young's "Busy Busy Busy" piece. I really couldn't believe it was done in pencil! 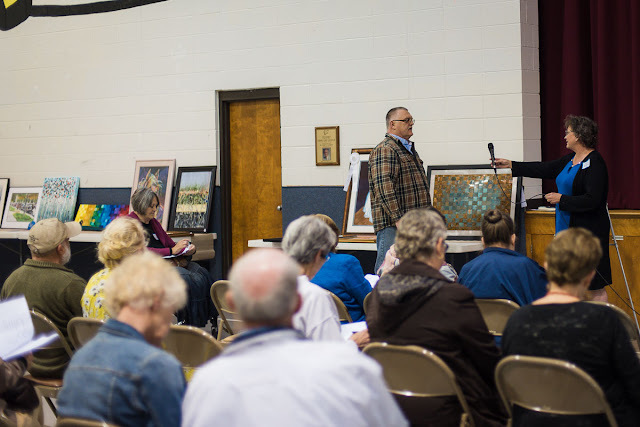 The treatment of the foreground and the combination of the reflective surfaces mixed in with nature intrigued her about Nash Cox's highly detailed watercolor painting. 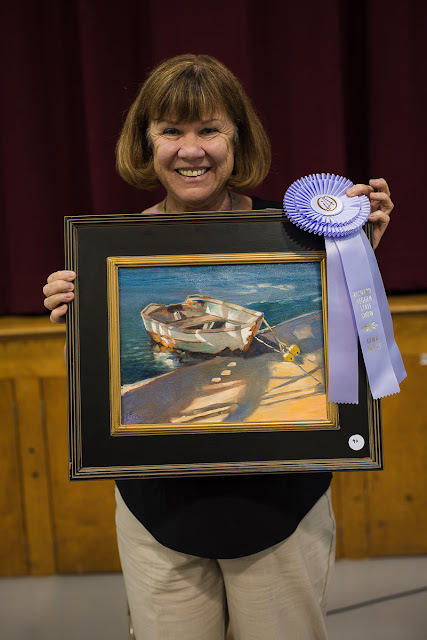 "Brooke's Tea Party" pastel by Margaret Askelsen earned a blue ribbon. One of the things that was really nice about this piece was how the curved line created by Brooke's hair extended into the curve of her hat... such a subtle sweet artwork. 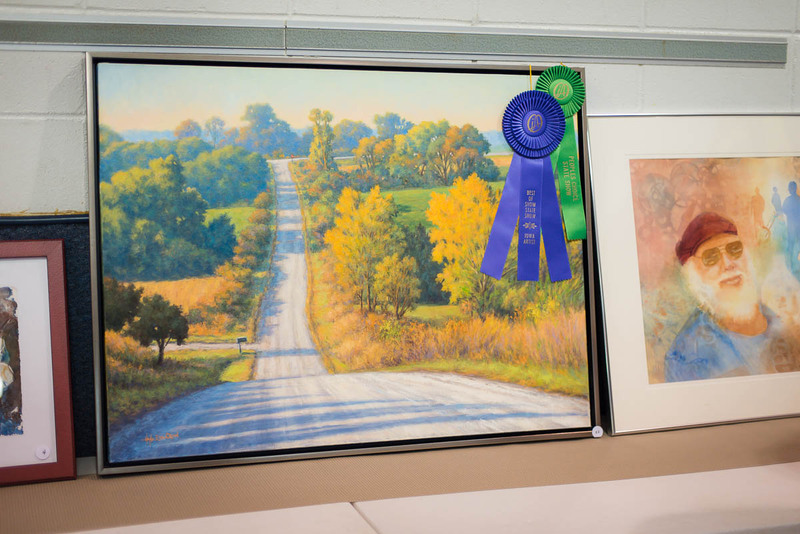 Marvella Blome's watercolor titled "Beautiful Light" earned a third place ribbon at the 2018 Iowa Artists State Show. 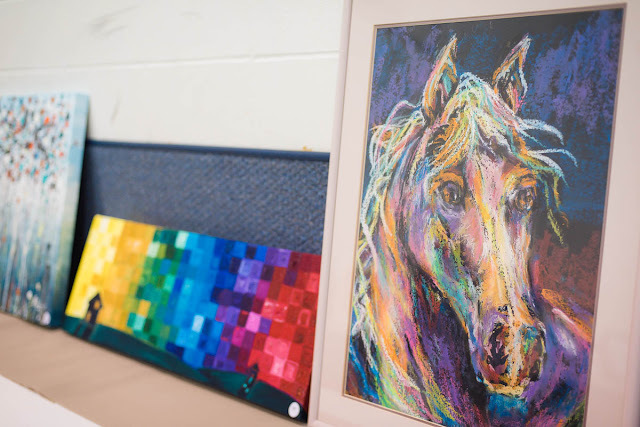 I believe it was the contrast in value that Caryn said caught her eye in this piece and the beautiful textures captured. Ron Deen used metal to create a 3-D artwork titled "Blue Mountain." Mary Johnson's "Come and Dance" earned an honorable mention and the judge commented that she really liked the way Mary didn't paint all the way to the edge on this and how she created separation and interest by using hard lines in some of the figures while leaving others soft. Dan Harry earned an honorable mention for his "Eagles 3" done in pencil. Caryn enjoyed his classical technique. The judge discusses "Casssidy-Just Beets" an oil painting by Lauretta Kelly. 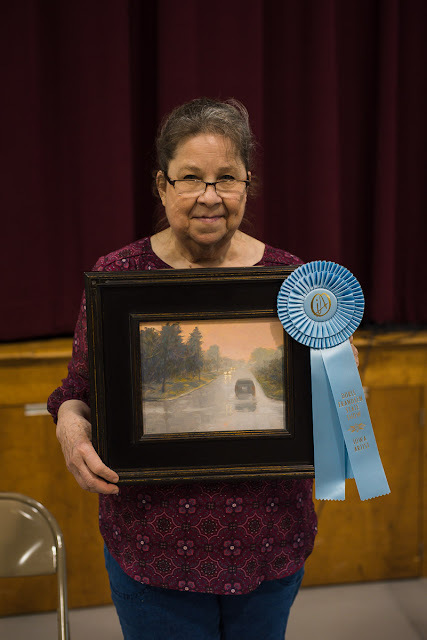 The judge thought Renae's treatment of the colors in her pastel piece titled "Peace like a River" was done very well. She stated it's hard painting Iowa with so much green and blue, but Renae did a beautiful job. 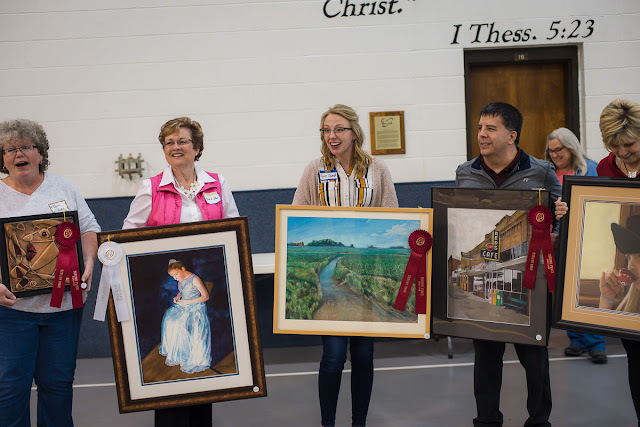 I hope you've enjoyed these images from a fun and inspiring day in Des Moines at the Iowa Artists State Show! Please feel free to share this blog post on your social media and with family and friends. 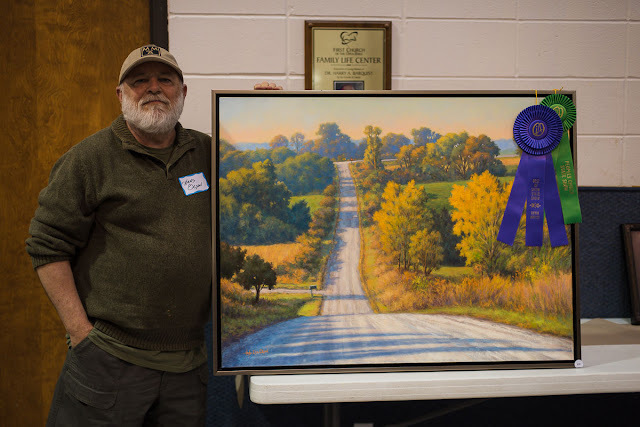 Click HERE to see my complete gallery of images from the 2018 Iowa Artists. 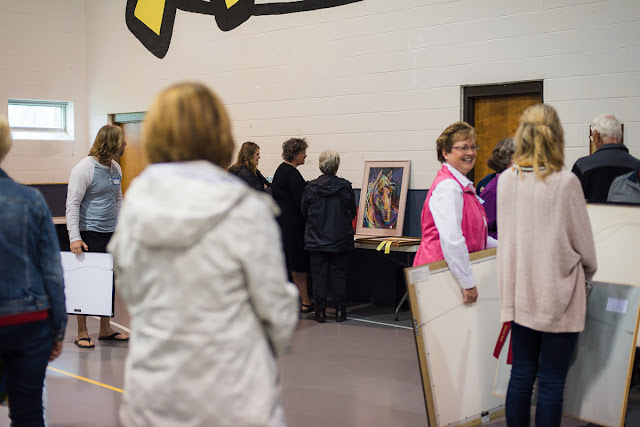 Best wishes for a wonderful Iowa summer art scene! ...AND a huge thank you to Caryn for her attention to detail, her time, sharing her knowledge, and even sharing a few last minute words of encouragement and critique to me at the very end of the show! 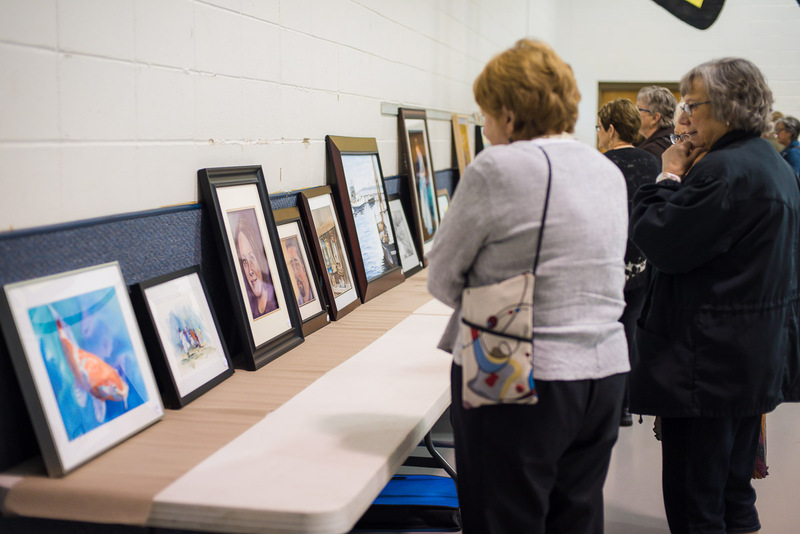 I'd also like to thank the artists and volunteers who helped organize the show. You were so kind with check-in and refreshments, and made sure everything ran so smoothly. 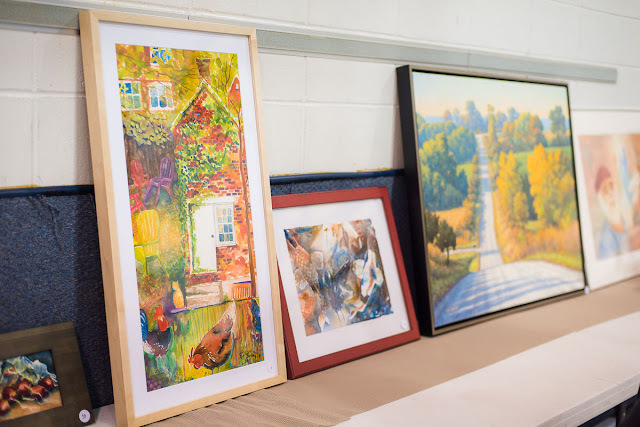 Art in the Park 2018, Elkader, IA - AUGUST 18 (10am to 5pm) & 19 (10am to 4pm) in Founders' Park. 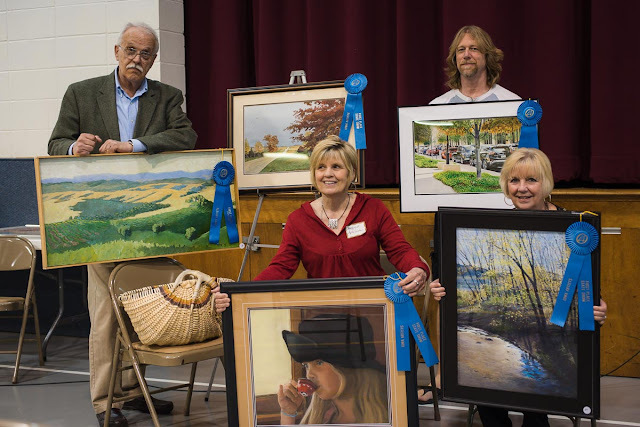 This juried 50-artist fine art festival is in its 4th year and held annually the 3rd weekend in August. 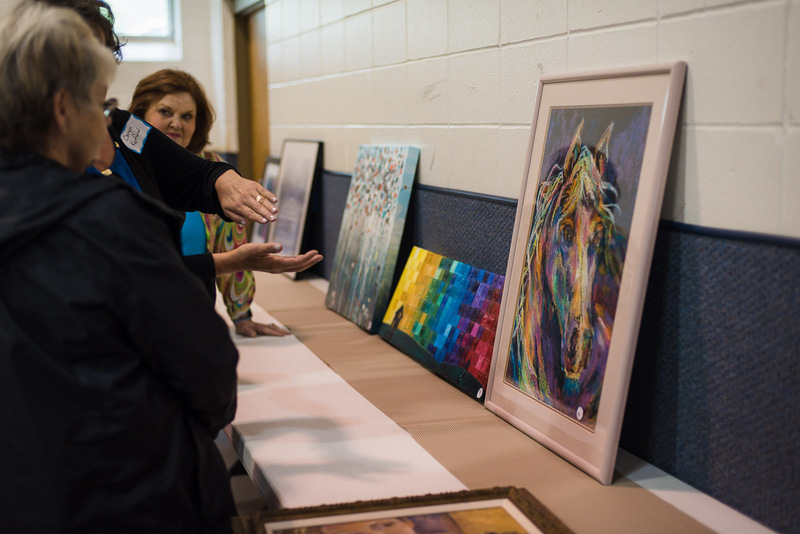 The artist selection has been made for 2018, but we hope you'll come check it out and apply for 2019! The Left Bank Shop and Gallery, McGregor, IA - Special Exhibit opening night is JUNE 1st from 6 to 8pm.